While visiting the Civitevecchia port of call in Italy, we got a bit adventurous. 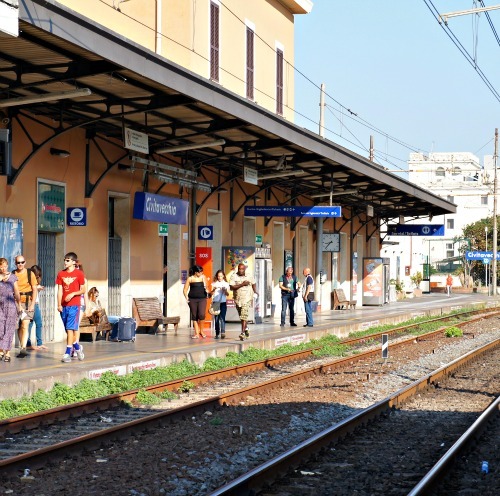 Normally I book excursions through Carnival Cruise Lines when the place I want to see is far away from our ship, but I was told that taking the train into Rome was very simple and we tagged along with my good friend, Stefanie, and her family to the train station on the way to Rome to get the hang of it. For $12 euros a person (just $5 for little kids), we purchased an all-day train ticket and took the train directly into Rome. I purchased a “Skip The Line” guided tour of the Vatican Museums, Sistine Chapel and Saint Peter’s Basilica with an English speaking guide through Viator.com for $47 each but it did not include the actual price of our Vatican Museum entrance ticket, which was an additional $22 euros for me and $14 euros for Angeline because she met the child age restrictions (15 and under). 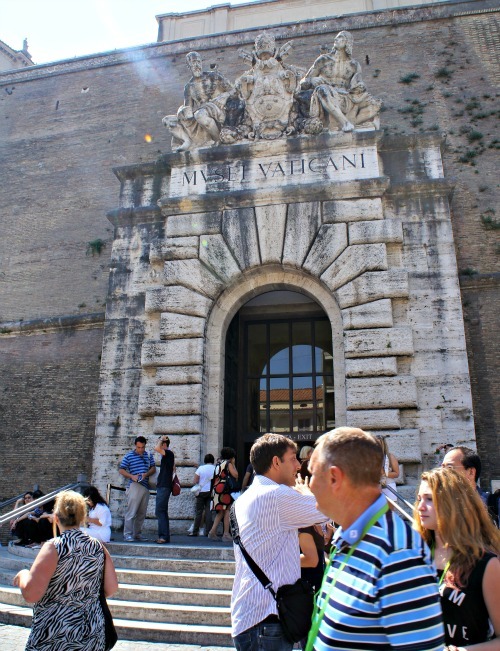 Our tour was operated through Hello Rome, whose offices were located directly across from the gate of Vatican City. Talk about convenient! 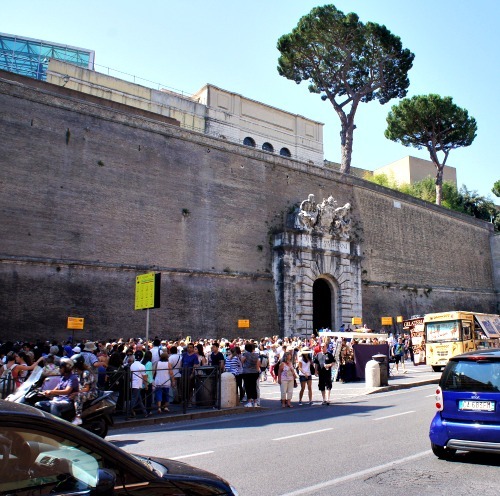 That might seem to be expensive and wasteful BUT the line to buy tickets to the Vatican was so long that it wrapped around the walls of Vatican City – and the line to enter Saint Peter’s Basilica was even longer, stretching out into the city of Rome itself. Stefanie said that you could wait up to four or five hours without advanced tickets! You can buy this “Skip the Line” tour through Viator.com or through the Vatican itself, online for a fee of about $22, I believe. 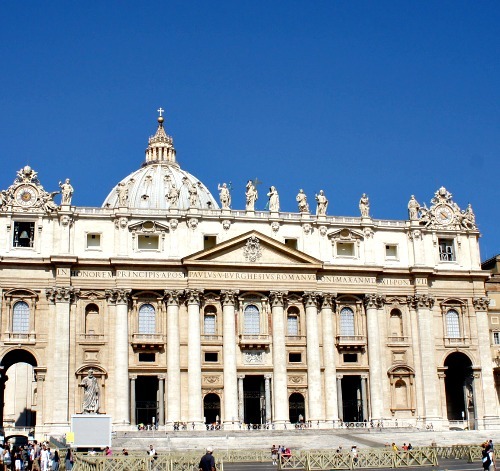 Though buying tickets through the Vatican website does not include any kind of tour or tour guide. I prefer a tour guide when visiting a place I don’t know much about, and not being Catholic myself, I know very little about the Vatican, aside from the fact that the Sistine Chapel lies there. Now, there’s a rule throughout all of Europe that your shoulders and knees must be covered when entering holy places, like cathedrals, chapels, etc. If you are wearing shorts and tank tops, strapless dresses, etc, you can run across the street and buy a scarf or shawl for about $10 from one of the many street vendors. In fact, they’ll walk up to you and ask you to buy one if you aren’t dressed appropriately! We began our three hour tour by being given a set of headphones, provided by Hello Rome, so that we could hear our guide, Talio, as we wandered about. 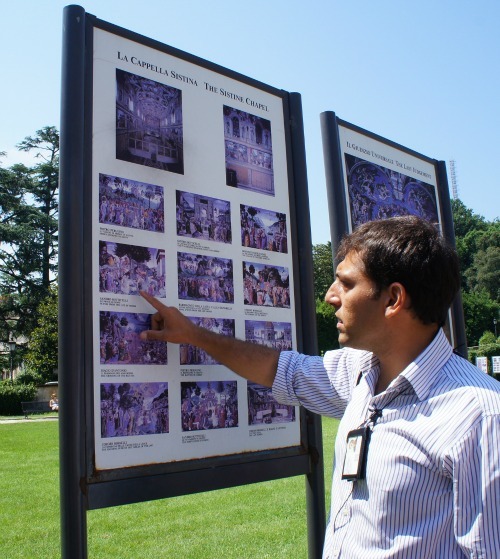 We gathered in front of the Vatican Gardens and Talio explained a bit about what we would see and where our tour would take us over the next three hours. The gardens themselves were quite beautiful and we had a few minutes to take photos while Talio showed us an informative map of the Sistine Chapel, explaining that you weren’t allowed to speak while in the chapel so he’d tell us everything we needed to know prior to going in. 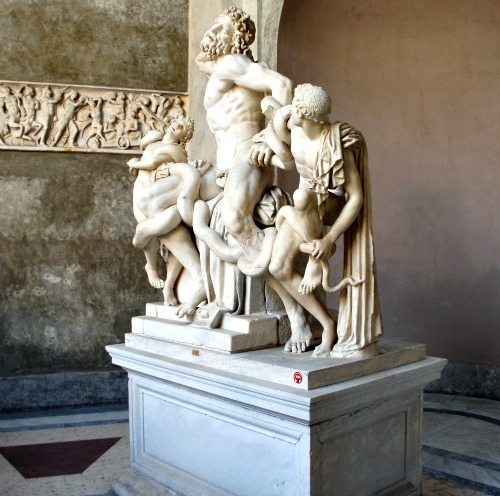 As we made our way through the Vatican Museum, Talio brought us to the most historically significant items and places within the museum, explaining as we went along the history not only of how each item came to be owned by the Vatican, but about life in Rome and around the Roman Empire as well. I’ve done quite a bit of studying on the Roman Empire, but it seems that our school system in Miami is severely lacking these days, because Angeline had never heard most of the information he shared with us. It kind of tickled me that she was learning Roman history…from a Roman. I think the things we learn when we travel are far more interesting – and easier to remember – than things we learn in books in stale classrooms, don’t you? The Sistine Chapel was everything I hoped that it would be; I only wish that there was more light in the room so that I could better see it. It wasn’t dark, but it was dimly lit. How does one explain what it’s like to stand beneath one of the most famous paintings in the history of the world? I’m not a religious person; Catholicism, the book of Genesis, it means nothing to me. But art? Standing in the very room that Michelangelo once stood (or laid, as it were) it was awe-inspiring. Photos in books, seeing it in movies and television – it’s just not the same. We didn’t enter Saint Peter’s Basilica because honestly, at that point, we were soaked with sweat and Angeline had the beginnings of a migraine. And to be quite honest, my main objective in entering the Vatican was to see the Sistine Chapel, and that had been accomplished. 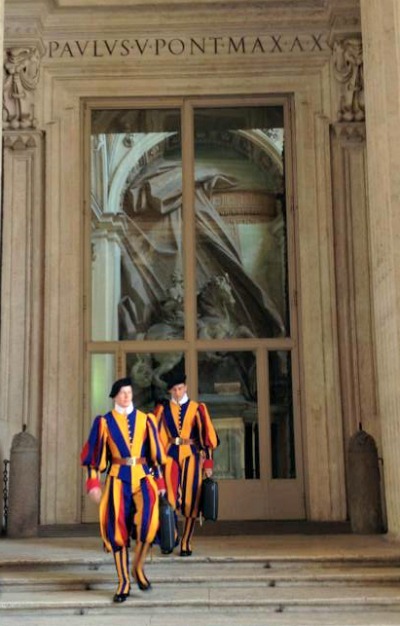 We did, however, catch a glimpse of the Swiss Guard, which was a delight. Did you know that those silly uniforms they wear are the same design they’ve worn for centuries? 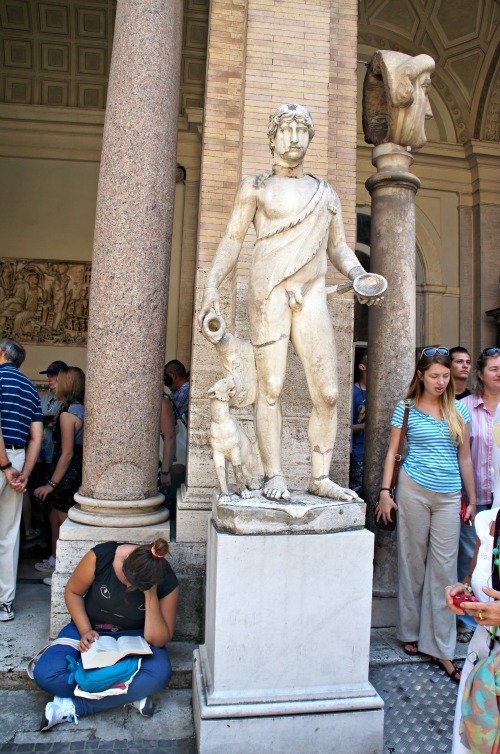 If you’re planning a visit to Rome, the Vatican Museums are a must-see…just make sure to buy your tickets or book your tour far in advance, because they do sell out and you don’t want to stand in line half a day in the sweltering heat! 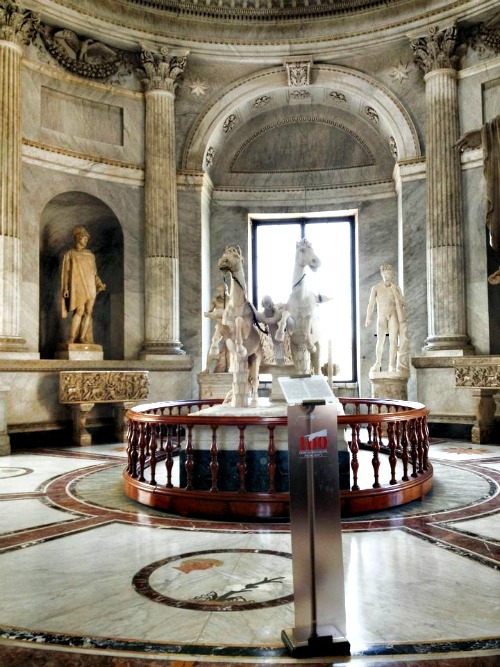 You can find the exact tour I booked through Viator, which was with Hello Rome, here.